I only had one day off this weekend, so I tried to rest my ankle as much as possible. I spent most of the daylight hours sitting in the front yard and trying to get some of the weeds under control. I made a little progress at that, but it's still a jungle out there. By Sunday, I was able to walk without shuffling too much. Benny certainly has no mercy when it comes to dragging me after people he believes are getting away with HIS contraband. I'm not going to be at work on the 14th this year, so I said I would bring in a pie a few days early. I spent this evening throwing together a cherry/rhubarb pie with ingredients from my garden. 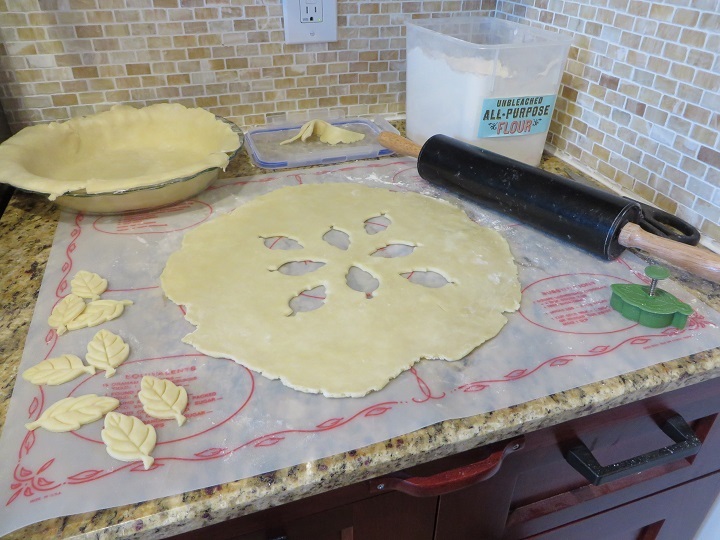 In the process, I finally used my baking nook for rolling out crust, as I had intended when I designed it. I'll have to find out tomorrow whether the pie tastes as good as it looks. Those little leaves are adorable! I'm never that fancy when I make pies. I'm never that fancy when I make pies. It's the first time I've used the decorative cutter, though I bought it quite a while ago. I just don't make pie as often as I want to. I'm definitely looking forward to lots more pie-making once my fruit trees advance into high production. I concur: the cut-outs are adorable. I love that nook! The cookie cutter is perfect for this time of year! I am sooo much happier with my renovated kitchen! Things like this are significantly easier now. Gorgeous! I hope it tasted delicious. Maybe someday I will have a renovated kitchen. I hope it tasted delicious.